When Oklahoma City guard Russell Westbrook left with an ankle injury in the third quarter, the New Orleans Pelicans had a chance to make a run. New Orleans coach Alvin Gentry labeled the final two minutes of the third quarter a disaster. 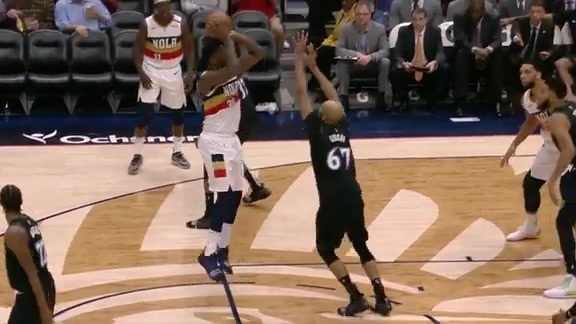 On paper at least, New Orleans faced its most beatable opponent Monday during a challenging five-game West road trip, while seeking its first victory. Threekola has found a home, and The Brow, a great partner. Randle collected 26 points (10-10 FG, 2-2 3Pt, 4-4 FT), eight rebounds, two blocks, one assist, and one steal in 28 minutes during Monday's 122-116 loss to the Thunder. Pelicans forward E'Twaun Moore previews tonight's road match-up vs. the Oklahoma City Thunder. Pelicans forward Wesley Johnson previews tonight's road trip vs the Oklahoma City Thunder. Pelicans guard Elfrid Payton gives an update on his progress so far from his ankle injury.